Yr 4 from St Joseph’s Cathedral Primary School in Swansea presenting the Give It Up assembly to the whole school! Pupils from across the Archdiocese of Cardiff (including Menevia & Herefordshire) have given up some of their favourite things this Lent to help communities around the world who have been affected by climate change, as part of this year’s Give It Up Lent fundraising campaign. In assemblies presented by our wonderful school volunteer team, children heard about the challenges that Mahinur and her family in Bangladesh are facing. Mahinur lives by a river with her husband Khalek and 12-year-old son Rabiul, who both have disabilities. She relies on fishing in the river to support her family, but last year it dried up and all the fish died. The fish have not returned. Some days the family just drink water for dinner. This is not right. God has given enough resources on this planet for everyone. No one should go hungry. So how how to inspire children to recognise need and to be motivated to help? Lent soup lunches have been organised by St Frances of Rome parish in Ross-on-Wye on the Friday lunchtimes through Lent with proceeds all going to support CAFOD. 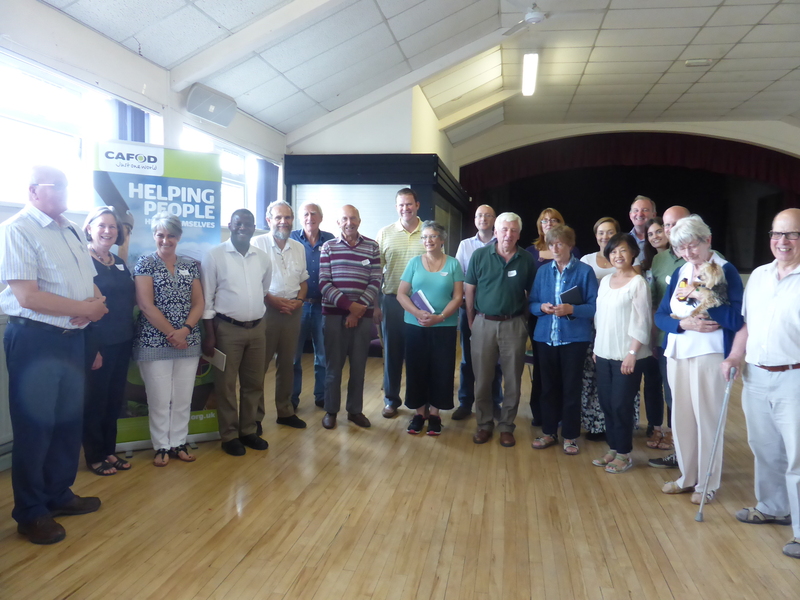 A big thank you too to Jane Davies and fellow parishioners at at Belmont Abbey parish for organising a wonderful, tasty Soup Supper which also provided an opportunity to learn more about CAFOD’s work around the world, in schools here in England and Wales, advocacy and campaigning. We are always so grateful for your prayers and commitment to organising events like these to raise awareness of the plight of people like Mahinur – who is the part of the Lent Fast Day narrative this year. Mahinur lives in Bangladesh. You may have heard the short talk at Mass a few weeks ago, but please do read the fuller story about Mahinur’s situation. With Lent starting next week, Ash Wednesday is 6 March, we’d like to invite volunteers in and around Cardiff to pop into our volunteer centre (North Chambers, Castle Arcade, Cardiff CF10 1BX) on Thursday 7 March between 11 am-12.30pm to hear more about this year’s Family Fast Day appeal. Throughout Lent we will be sharing the experience of Mahinur who is struggling with the changing weather. Mahinur lives in Bangladesh. She makes a living from fishing but a drought last year killed all the fish in the river that she lives next to and now she’s struggling to support her disabled husband, Khalek and her twelve year old son, Rabiul. The changing weather is devastating lives. Drought, floods and storms are having a catastrophic impact effect on some of the poorest members of our global family. Hardest hit are vulnerable groups such as women and people with disabilities. Both groups often live in extreme poverty and are excluded from job opportunities. People with disabilities also face stigma. The lack of support and income makes it harder for vulnerable people to prepare for disasters and to recover after disaster strikes. The most vulnerable and disaster-prone regions within Bangladesh are the south and south-west coastal areas. Mahinur is from the Patuakhali District on the wouthern coast. Last year, your donations were match funded by the UK government and the projects started in October 2018. “New nutrition projects in Zimbabwe, Eritrea and Zambia have begun. We’re on track to reach 239,000 people by the end of 2021!” Thank you! This Lent your donations will help ensure that no-one is beyond the reach of the love and care they need to flourish. Jamal, our local expert, grew up in the same region as Mahinur and is an expert in farming and fishing. He has already helped a few families her village, teaching them new farming techniques and distributing seeds, ducks and chickens. But sadly there hasn’t been enough money available yet to help Mahinur. And it’s a very sad fact that we are currently forced to turn away one in three requests for help, simply because there isn’t enough money to go around. On Friday 15 March, can you eat a simple meal in solidarity and give what you save to help us reach out to more families in desperate need of help? Your generosity is a lifeline for women, men and children all over the world. Thank you so much! In your parish. Pin up our eye-catching poster and use our short talk to introduce the parish to Mahimur. If you would like to have someone speak at Mass, please contact us. Get the children involved too by using our children’s liturgy and illustration for the first Sunday of Lent. Have a pancake party! Flip poverty on its head this Shrove Tuesday by challenging friends and family to pancake flipping competition. How many can you flip in 2 minutes? If everyone donates £2 to take part, your pancakes will make a big difference to families with nothing to eat. Pledge to eat soup this Family Fast Day! Have a simple soup meal and give what you save. Even better, gather a crowd and organise a soup-er fundraiser. We’ll send you a poster, guide and recipes… yummy. Here’s a recipe for a simple lentil soup. Prayer can move mountains. Our prayers of intercession can be used at church, with your prayer group, your family or on your own in quiet reflection. You can also order our prayer card from the CAFOD shop. Share our video of Mahinur on Facebook and social media. Together we can spread the message of love our global neighbours to thousands of people across England and Wales. If you can’t make this meeting, but you want to pop into the office to know more, please get in touch with us on 02920 344882 or email us. Volunteers from around the South West region which, in CAFOD terms, includes the Archdiocese of Cardiff and the diocese of Menevia, travelled to St Bonaventure’s parish in Bristol to meet country representatives who are working in Afghanistan, Bangladesh, Sierra Leone, Liberia and Ethiopia. 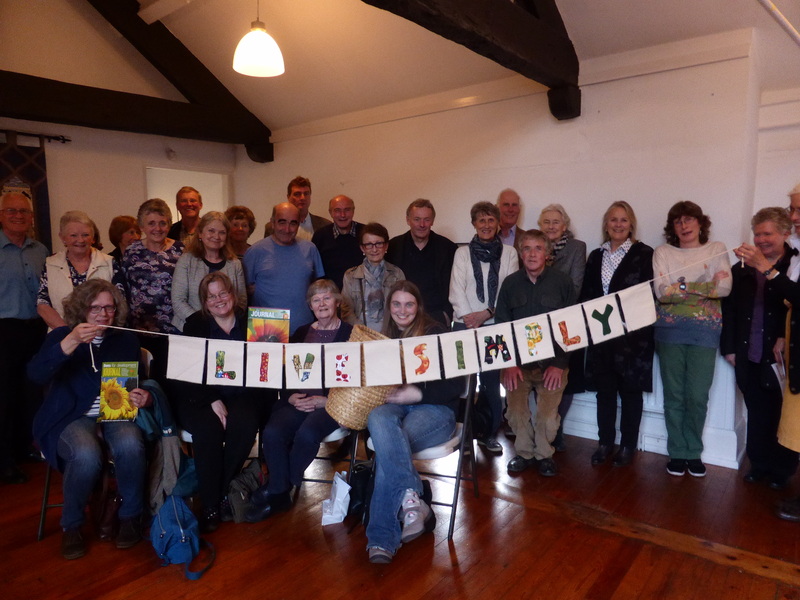 The liveSimply group tin Ross and Monmouth were delighted to welcome renowned UN consultant, Nicola Bradbear, to the Priory in Monmouth on 4 May. Nicola founded Bees for Development which works to assist beekeepers in developing countries. Beekeeping can help families move beyond subsistence farming and their crops can improve thanks to increased bee pollination. CAFOD is an overseas aid and development agency dedicated to improving the lives of the poorest people in our world. Here in England and Wales we work to educate people about the causes of poverty. We work to inspire them to campaign about issues of social justice and inequality and support them in fundraising activities. Overseas we work with local partners in over 40 countries in South America, Africa and Asia to deliver long-term development projects and emergency aid. CAFOD’s headquarters are in London and CAFOD South Wales is the local office for the Archdiocese of Cardiff and the Diocese of Menevia.